Guinea Pig anti Human, Mouse Nephrin. Immunohistochemistry/Immunofluorescence Microscopy on frozen tissue: 1/50. Immunohistochemistry on Paraffin Sections: 1/50 (microwave treatment recommended). Incubation Time: 1 h at RT or overnight at 2-8°C. Nephrin was first described as a kidney podocyte marker protein (MW 135,000 calculated from aa sequence data; apparent Mr 185,000 after SDS-PAGE). Nephrin is a transmembrane cell adhesion molecule located at the slit diaphragm. Primary steroid resistant nephrotic syndrome (SRNS) is characterized by childhood onset of proteinuria and progression to end stage renal disease. Kidney podocytes and their slit diaphragms form the final barrier to urinary protein loss. Congenital nephrotic syndrome (CNS) is caused by mutations in NPHS1 (nephrin) or NPHS2. Nephrin, a recently identified protein is a member of a group of podocyte proteins that constitute major component of the slit diaphragm especially in the foot process. Nephrin, a cell adhesion molecule, may play a crucial role in maintaining the glomerular filtration barrier. Recent studies have suggested that mutations in the gene for Nephrin reportedly lead to congenital nephrosis. 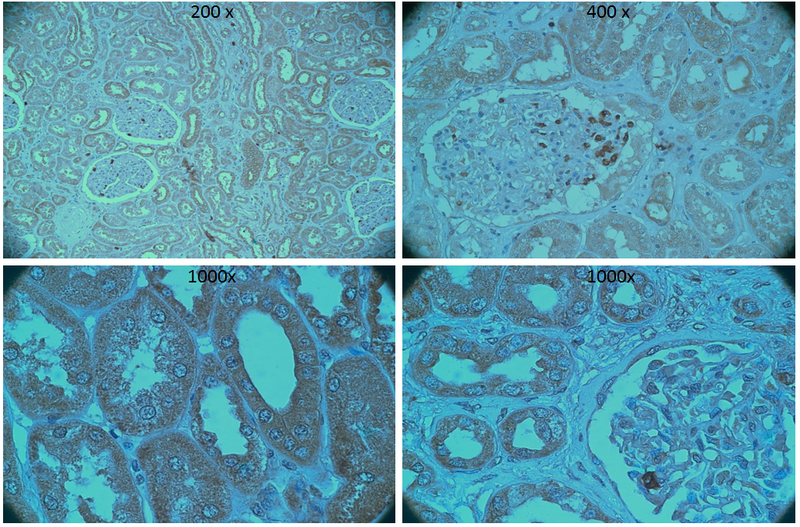 Three novel podocyte proteins, Podocin, Nephrin and alpha Actinin 4 have been identified in congenital and experimental models of proteinuria. The role of Nephrin in anti apoptotic activity in podocyte slit diaphragm is believed to be associated with vascular endothelial derived growth factors VEGF signaling. 1. Boini KM, Amann K, Kempe D, Alessi DR, Lang F. Proteinuria in mice expressing PKB/SGK-resistant GSK3. Am J Physiol Renal Physiol. 2009 Jan;296(1):F153-9. doi: 10.1152/ajprenal.90398.2008. Epub 2008 Nov 5. PubMed PMID: 18987114. 2. Huber TB, Hartleben B, Winkelmann K, Schneider L, Becker JU, Leitges M, et al. Loss of podocyte aPKClambda/iota causes polarity defects and nephrotic syndrome. J Am Soc Nephrol. 2009 Apr;20(4):798-806. doi: 10.1681/ASN.2008080871. Epub 2009 Mar 11. PubMed PMID: 19279126. 3. Chittiprol S, Chen P, Petrovic-Djergovic D, Eichler T, Ransom RF. Marker expression, behaviors, and responses vary in different lines of conditionally immortalized cultured podocytes. Am J Physiol Renal Physiol. 2011 Sep;301(3):F660-71. doi: 10.1152/ajprenal.00234.2011. Epub 2011 Jun 1. PubMed PMID: 21632959. 4. Thomasova D, Bruns HA, Kretschmer V, Ebrahim M, Romoli S, Liapis H, et al. Murine Double Minute-2 Prevents p53-Overactivation-Related Cell Death (Podoptosis) of Podocytes. J Am Soc Nephrol. 2015 Jul;26(7):1513-23. doi: 10.1681/ASN.2014040345. Epub 2014 Oct 27. PubMed PMID: 25349197. 5. Okamoto K, Honda K, Doi K, Ishizu T, Katagiri D, Wada T, et al. Glypican-5 Increases Susceptibility to Nephrotic Damage in Diabetic Kidney. Am J Pathol. 2015 Jul;185(7):1889-98. doi: 10.1016/j.ajpath.2015.03.025. Epub 2015 May 15. PubMed PMID: 25987249. 6. Kokkinopoulou M, Spiecker L, Messerschmidt C, Barbeck M, Ghanaati S, Landfester K, et al. On the Ultrastructure and Function of Rhogocytes from the Pond Snail Lymnaea stagnalis. PLoS One. 2015 Oct 21;10(10):e0141195. doi: 10.1371/journal.pone.0141195. eCollection 2015. PubMed PMID: 26488403. 8. Mulay SR, Romoli S, Desai J, Honarpisheh MM, Kumar SV, Anders HJ, et al. Murine Double Minute-2 Inhibition Ameliorates Established Crescentic Glomerulonephritis. Am J Pathol. 2016 Jun;186(6):1442-53. doi: 10.1016/j.ajpath.2016.01.017. Epub 2016 Apr 18. PubMed PMID: 27102769. 9. Saito, R;Rocanin-Arjo, A;You, YH;Darshi, M;Van Espen, B;Miyamoto, S;Pham, J;Pu, M;Romoli, S;Natarajan, L;Ju, W;Kretzler, M;Nelson, R;Ono, K;Thomasova, D;Mulay, SR;Ideker, T;D'Agati, V;Beyret, E;Belmonte, JC;Anders, HJ;Sharma, K;2016Systems biology analysis reveals role of MDM2 in diabetic nephropathy. JCI Insighte 2016, e87877. 1, 17. PubMed PMID: 27777973. Kestilä M, Lenkkeri U, Männikkö M, Lamerdin J, McCready P, Putaala H, et al. Positionally cloned gene for a novel glomerular protein--nephrin--is mutated in congenital nephrotic syndrome. Mol Cell. 1998 Mar;1(4):575-82. PubMed PMID: 9660941. Putaala H, Soininen R, Kilpeläinen P, Wartiovaara J, Tryggvason K. The murine nephrin gene is specifically expressed in kidney, brain and pancreas: inactivation of the gene leads to massive proteinuria and neonatal death. Hum Mol Genet. 2001 Jan 1;10(1):1-8. PubMed PMID: 11136707. Huh W, Kim DJ, Kim MK, Kim YG, Oh HY, Ruotsalainen V, et al. Expression of nephrin in acquired human glomerular disease. Nephrol Dial Transplant. 2002 Mar;17(3):478-84. PubMed PMID: 11865096. Aaltonen P, Luimula P, Aström E, Palmen T, Grönholm T, Palojoki E, et al. Changes in the expression of nephrin gene and protein in experimental diabetic nephropathy. Lab Invest. 2001 Sep;81(9):1185-90. PubMed PMID: 11555666. Bussolati B, Deregibus MC, Fonsato V, Doublier S, Spatola T, Procida S, et al. Statins prevent oxidized LDL-induced injury of glomerular podocytes by activating the phosphatidylinositol 3-kinase/AKT-signaling pathway. J Am Soc Nephrol. 2005 Jul;16(7):1936-47. Epub 2005 Apr 20. PubMed PMID: 15843472. Meyer-Schwesinger C, Dehde S, Klug P, Becker JU, Mathey S, Arefi K, Balabanov S, Venz S, Endlich KH, Pekna M, Gessner JE, Thaiss F and Meyer TN. 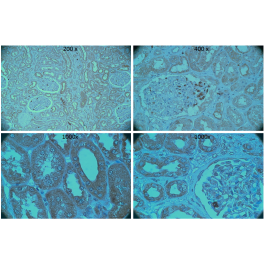 Nephrotic Syndrome and Subepithelial Deposits in a Mouse Model of Immune-Mediated Anti-Podocyte Glomerulonephritis. DOI: 10.4049/jimmunol.1003451 The Journal of Immunology, September 15, 2011 vol. 187 no. 6 3218-3229. Schiwek D, Endlich N, Holzman L, Holthöfer H, Kriz W, Endlich K. Stable expression of nephrin and localization to cell-cell contacts in novel murine podocyte cell lines. Kidney Int. 2004 Jul;66(1):91-101. PubMed PMID: 15200416. 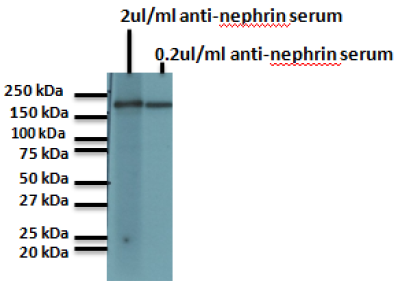 The antibody reacts specifically with Nephrin. Immunolocalization: Antibody BP5030 stains positively podocytes of the kidney, radial glial cells of the brain, Sertoli cells of testis, and beta islet cells of the pancreas. Tested Reactivities on Cultured Cell Lines: PCL (Podocyte Cell Line), M-1 (Cortical Collecting Duct Cells).